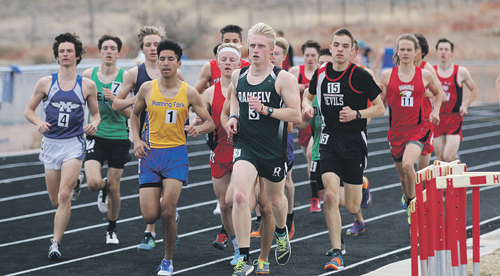 RANGELY | The Rangely Panther track and field team finished up their spring break by taking 12 athletes to the Hotchkiss Invitational on Saturday, March 24. The weather was much better than the previous week’s meet and the competition was at their best. The Rangely Panther boys’ team finished seventh out of 18 teams while the girls placed 13th out of 17 teams. “Considering our size and that we were competing against 3A and 4A schools with teams that are twice our size, I am really pleased that we placed as well as we did. Our athletes have been working hard and are making a lot of progress already this season. I am excited to see what these athletes will be doing at the end of the season,” said head coach Beth Scoggins. Senior Patrick Scoggins was named male athlete of the meet and was awarded the Ben Eastman award. Ben Eastman was a runner who won a silver medal in the 1932 Olympics in the 400-meter dash and one of only three American athletes to hold both the 400- and 800-meter run world record. Eastman helped build and establish the track and field program at Hotchkiss before his death in 2006 at the age of 91. The award was voted on by all the coaches at the meet. Scoggins started the meet with a first place finish in the 1600-meter run with a time of 4 minutes, 45.95 seconds, a new personal record. He took first in the 800 run with a time of 2:00.89 which is a season personal best. Senior Austin Ficken had a huge throw of 42 feet, 2 inches, earning him first place in the shot put, and then earned fourth in the discus with a throw of 118-06. Both of those throws are season personal bests. Cameron Filfred threw both the shot and discus with throws of 31-11 and 89-05. Miekka Peck, the other senior competing, took seventh in the discus with a throw of 84-09. She also threw the shot for a new personal record of 28-02 taking 15th place and ran the 100 dash in 16.56. Juniors Mackenze Cochrane, Marshall Webber and Raelynn Norman had strong performances and added to the point total for the Panthers while juniors Anna Forbes and Elena Forbes continue to show improvement. In the shot Cochrane threw 30-2 for seventh place, and then placed second in the discus with a new personal record of 100-1. Webber overcame a hurdle that was knocked into his lane during the 110 high hurdles and still got a time of 19:09 for fifth. He then placed third in the 300 hurdles with a time of 46:01. Norman ran the 400 dash taking 14th place with a time of 1:12.40 and then finished fourth in the 3,200-meter run with a time of 13:59.67. Both were new personal records for her. Anna Forbes earned a personal record in the shot with a throw of 23-11 and ran the 100 dash in 17.36. Elena Forbes earned a personal best in the shot with a throw of 25-9 and launched the discus for a throw of 71-11. She ran the 100 dash in 17.25. The Panthers had two sophomores competing and both earned personal records in their events. Chloe Filfred ran the 800 in 3:13.34 for 25th place. Brady Bertoch threw the discus 68-4 and then tossed the shot 28-01 for a new personal best. Gabe Polley was the only competing freshman at the meet. He competed in four events: high jump, long jump, 200-meter dash and helped out in the 4×400. Unfortunately, he wasn’t able to clear the bar in high jump but was able to get a long jump of 14-01. He also had a personal best in the 200 with a time of 28.11. The boys put a 4×400 relay again and bettered their time from the week before with a time of 4:06.09 for ninth place. The relay team was made up of Webber, Scoggins, Polley and Filfred. “This relay team keeps amazing me, they work hard every day in practice and they want to keep improving,” Scoggins said. The Panthers will be busy next weekend with a meet in Meeker on Friday then in Cedaredge on Saturday.